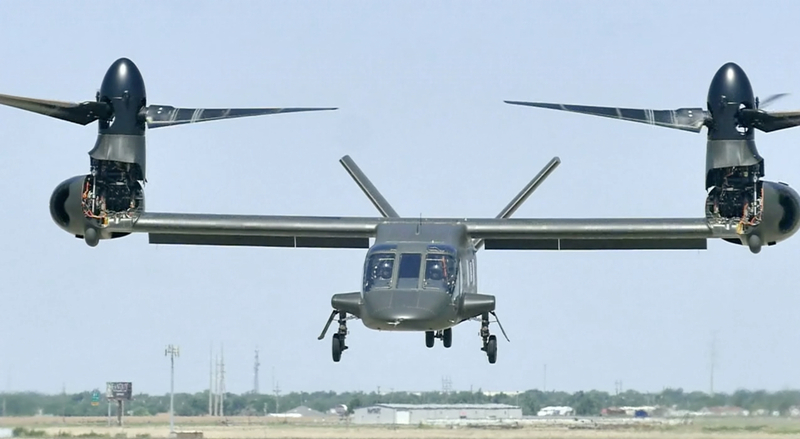 Vídeos a cámara lenta del prototipo del V-280 Valor, una de las dos propuestas para el programa FVL (Future Vertical Lift). Vista la foto de frente he de reconocer que me parece demasiado voluminoso para convertirse en el aparato estándar de transporte. Lo veo como muy aparatoso, que presenta mucho blanco para el fuego enemigo, que ocupa demasiado en tierra... no sé si me explico. Como obra de ingeniería me gusta mucho, pero mi impresión es que es demasiado caro y complejo. Además de los problemas que comentas. A destacar como los elementos del motor quedan descubiertos en la configuración de helicóptero. Por cierto, una de las misiones del Osprey es llevar suministros y personas a portaviones. Me pregunto si los autogiros serían una alternativa, aunque no se han diseñado con tanta capacidad de carga. Si, tiene una envergadura que solo un tipo de buque podría permitirse. Apache británico tiene que hacer un aterrizaje de emergencia por algún fallo. Los paisanos de la zona acuden y se lo enseñan. With Russian intervention in Syria, the helicopter once again is playing a frontline role. Alex Mladenov looks at the Russian helicopter operations in the war in Syria. The Hind-Fs were typically employed in combat in a light configuration, armed with two 20-round B-8V20-A packs, each loaded with S-8 80mm rockets in addition to a full ammunition load of 470 rounds for the 30mm GSh-30K twin-barrel fixed cannon. The guided ordinance onboard was represented by two to four 9M114 Shturm-V or 9M120 Ataka-V anti-tank guided missiles (ATGMs) with radio-beam guidance, used in two versions. The first of these comets with a shaped-charge warhead for knocking out armored targets while the second is equipped with a blast-fragmentation warhead for use against soft targets and manpower on open. There are many video footages uploaded on the internet – usually taken by the rebels on the ground in November and December 2015 – showing the typical combat employment pattern of the Russian Hip-Fs rushed in CAS missions in the initial months of the war. The Mi-24Ps were mainly used to attack their pre-planned targets in four-ship formations, divided into two pairs. These usually initiated their long firing passes in a shallow dive at between 330-660ft (100-200m) above terrain. When in range, the Hind-Fs release one, two or even three salvoes of rockets and then continue flight towards the targets to engage them with the 30mm cannon. After a burst at point-blank ranges the helicopters exiting from the attack pass at very low level, often only 70-100ft (20-30m) above terrain in tight U-turn, with the pairs covering each other in the process. When turning away from the just-attacked targets at ultra-low level, the Mi-24Ps dispense salvoes of heat-emitting flares to avoid the threat of heat-seeking man-portable air defense systems (MANPADS) that may be launched side-on or tail-on. Another anti-MAPNPAS measure is to fly as low as possible when exiting form attack because, as a rule, MANPADS are not able to fire at air targets flying at 70-100ft (20-30m) altitude. The main weapon for area saturation is the 1980s-vintage S-8 rockets, usually launched from less than 4,920ft (1,500m) distance. The Mi-24P’s 30mm forward-firing fixed cannon is known as a precise weapon releasing highly destructive 390g fragmentation/high-explosive and armor-piercing shells from 2,624 to 4,920ft (800 to 1,500m) distance. When used against manpower, the 30mm fragmentation/high-explosive shells create fragments that are lethal within a radius of about 10ft (3m). The day/night-capable Mi-35Ms deployed to Syria were observed in active operation operating off Hmeimim and Shairat airfields. They typical armament comprised of a pair of B-8V20-A rocket packs, each loaded with 20 rockets in addition to four 9M120 Ataka-V radio beam-guided ATGMs, useful for knocking out small-size hardened targets up to 3.1nm (5.8km) distance. The Mi-35M is also armed with a turret-mounted twin-barrel GSh-23L 23mm cannon in the nose. The Ka-52s in Syria are reported to have been armed with Ataka-1 missiles in two versions – the first of these (9M120-1) comes equipped with a shaped-charge warhead for knocking out armored targets, while the second (9M120-1F-1) sports a fragmentation/blast warhead. There were no armored targets justifying the use of the Ataka-1’s anti-armor derivative, so only missiles with fragmentation/high-explosive warhead were used in anger, together with S-8FP 80mm rockets. This version of the well-known 80mm folding-fin rocket is fitted with a powerful fragmentation/high-explosive warhead. Video footage shows that the rocket attacks were carried out from close range to the targets, with S-8FPs fired from about 660ft (200m) above terrain, at a slant range of about 4,920ft (1,500m). On 8 July 2016, a Mi-35M was brought down in Homs province during a CAS mission. Initially the Russian MoD denied the loss, and then released info that the Mi-25 helicopter belonged to the Syrian military but was with a Russian crew abroad. Eventually, Daesh published on the web a video footage with the shoot down showing that it was a Mi-35M, easily distinguished by its shortened wings compared to the baseline Mi-24/25. The helicopter was in a shallow dive attack, unleashing rockets and shortly after the last salvo it took a hit in the tail from an unidentified weapon. The out of control machine began rotating around the vertical axis and then collided with the ground. The crew was instantly killed upon impact. Pues estos también podían mirar el H160M, con los 200 para Francia, 70/80 para Alemania y nosotros con otros 50...Airbus Helicopters se pondría muy contenta. Seria una novedad que los nuestros se montaran aqui. Las colas las tenemos aseguradas, es para lo que hemos quedado.